Baden dimpled Pitching machine ball with indented red seams. 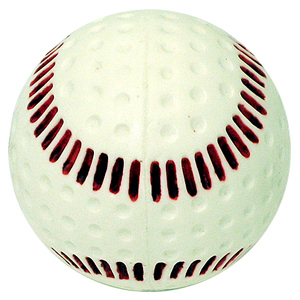 The PBBRS Patented Seamed is a dimpled, white, pitching machine ball, with indented red seams. This is the best dimpled pitching machine ball on the market. Shipping is $35.00 to $45.00 per case lower 48 states. Free shipping if ordering more than 8 cases. These can also be used for soft toss batting practice, and used in very wet conditions for batting practice outdoors or fielding.